Through our testing, we've discovered a little under a dozen popular products that can process ESI: Varnish, Squid Proxy, IBM WebSphere, Oracle Fusion/WebLogic, Akamai, Fastly, F5, Node.js ESI, LiteSpeed and some language-specific plugins. Not all of these are ESI-enabled by default but this is discussed further below. The ESI language is based on a small set of XML tags and is used in many popular HTTP surrogate solutions to tackle performance issues by enabling heavy caching of Web content. ESI tags are used to instruct a reverse-proxy (or a caching server) to fetch more information about a web page for which a template is already cached. This information may come from another server before serving it to the client. This allows fully cached pages to include dynamic content. One common use case for ESI is serving a largely static page with dynamic pieces of data. ESI adds caching flexibility by allowing developers to replace dynamic portions of a page with ESI tags. Thus, when the page is requested, the ESI tags are processed and fetched by the proxy, ensuring the performance of the back-end application servers. The image below can be used to illustrate a typical use case of ESI, where a weather website would cache the content of a city's weather page. Dynamic data would then be replaced by their respective ESI tags pointing to an API endpoint URL. The initial ESI specification dates back to 2001 and each vendor's implementation widely varies. The feature set for each product is different; some features will be missing from some products, but will be present in others. You can read more about the original ESI specification here: http://www.w3.org/TR/esi-lang. It describes the markup language usage and common features. Various vendors, including Akamai and Oracle, have also added additional features beyond the specification. 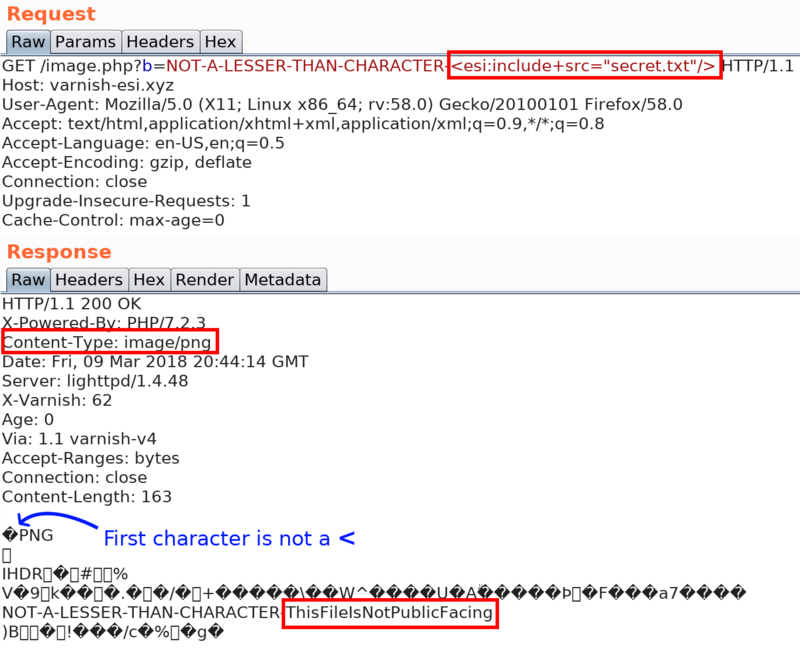 HTTP surrogates are not able to distinguish between legitimate ESI tags provided by the upstream server and malicious ones injected in the HTTP response. In other words, if an attacker can successfully reflect ESI tags in the HTTP response, then the surrogate will blindly parse and evaluate them, believing they are legitimate tags that are served from the upstream server. For the ESI parser to process the ESI tags, the less-than < and greater-than > characters must not be encoded or escaped. These days, web application servers will usually escape special characters that are user-controllable to mitigate XSS attacks. While this would effectively block reflected ESI tags from being parsed by the surrogate, ESI tags can sometimes be injected in HTTP responses that are not HTML. Indeed, one of the modern features of ESI is to allow developers to add dynamic content to otherwise cached and static data sources, such as JSON objects and CSV. An exhaustive tutorial on ESI+JSON can be found on the Fastly blog, showing that ESI parsers can be configured to process ESI tags found in JSON objects. Since modern frameworks will try to contextualize their escaping efforts, it is not uncommon to see API endpoints allow HTML-like strings in JSON attributes, since they are not supposed to be interpreted by a browser as HTML. However, this allows attackers to poison an input that is reflected in a JSON response with ESI tags which would be interpreted by the surrogate during transit. The previous scenario is rather rare, considering it does not represent a default behavior of any analyzed ESI-capable product. Most common attack vectors will be reflecting ESI tags by the back-end server, which would then be processed by a load balancer or proxy with ESI enabled. Obviously, if user-input is properly sanitized, as it should be to mitigate XSS attacks, ESI tags will be encoded and never processed by surrogates. Arguably, the most common and useful feature of the ESI specification is the use of includes. ESI includes are tags which, when processed by the proxy or load balancer, perform a side HTTP request to fetch dynamic content. If an attacker can add an ESI include tag to the HTTP response, they can effectively perform SSRF attacks in the context of the surrogate server (not the application server). The surrogate server receives the response, parses it to check if any ESI tags are present. The surrogate server parses the reflected ESI tag and performs the side-request to evil.com. Some ESI implementations do not support ESI vars and would thus invalidate this technique. When includes are available, and it is possible to point them to an external domain, one could simply include an external page containing the XSS payload. The following example depicts a typical SSRF-to-XSS attack using ESI includes. The SSRF will fetch the poc.html page and display it in the webpage, adding our payload to the DOM. By design, HTTP surrogates such as proxies and load balancers have access to the full HTTP requests and responses. This includes all cookies sent by the browser or the server. A useful feature of the ESI specification is the ability to access cookies in transit inside ESI tags. This allows developers to reference cookies in the ESI engine, giving them more flexibility by leveraging the statefulness of cookies. 127.0.0.1 evil.com - [08/Mar/2018:15:20:44 - 0500] "GET /?cookie=bf2fa962b7889ed8869cadaba282 HTTP/1.1" 200 2 "-" "-"
As stated earlier, ESI implementations vary largely from one vendor to another. The feature set differs from one product to the next, and some features are not implemented in the same way. We tested a few products to identify the possible attacks that can be leveraged against ESI-capable software and produced the table below. This column documents if the <esi:includes> operand is implemented in the ESI engine. This column documents if the <esi:vars> operand is implemented in the ESI engine. This column documents if the cookies are accessible to the ESI engine. This column documents if upstream headers are required for ESI to function. Unless the headers are provided by the upstream application server, a surrogate will not process ESI statements. This column documents if ESI includes are only possible towards whitelisted server hosts. When this is true, ESI includes cannot be used to perform SSRF against hosts other than the whitelisted ones. The following section will go into more detail regarding ESI implementations and vendor-specific features. Some implementations of ESI will allow you to specify which cookie to extract; Squid does not offer this, you must exfiltrate all cookies at once. The Varnish implementation of ESI is quite solid in terms of security. The ESI include instructions can only be performed towards the upstream server defined by the VCL (Varnish Configuration Language). This means that ESI includes cannot lead to SSRF against arbitrary hosts. All SSRF will be redirected towards the upstream server, mitigating most of the issues SSRF attacks usually introduce. As of the release of this blog post, ESI vars are not yet implemented in Varnish Cache. The documentation specifies that vars and cookie access are on the roadmap. When this feature is deactivated, users could use a file upload feature (such as a profile picture feature) and add ESI tags to the uploaded data. They can then ask the server to serve the content back, leading to ESI injection. Fastly uses a heavily customized Varnish back end, meaning most of the previous section also applies to this one. The only two identified differences are that the upstream server for ESI includes does not require a surrogate-control header for Fastly to parse the ESI content. Also, the CRLF injection does not seem to impact Fastly. Akamai had a large role in the development of the ESI specification (as author and editor). This can be seen by the large range of features present in their ESI implementation, and the extremely detailed documentation they offer regarding ESI. Obviously, we wanted to test their ESI implementation. In late 2017, we contacted our Akamai security contacts personally mentioning our ongoing research on ESI injection. Since Akamai is a paid service provider, we asked to obtain a production-grade test image where we could perform various ESI-related tests, but we were kindly turned down. Since we were not getting ESI instances for research purposes, we tried obtaining a presale trial, but never heard back from their sales teams. We eventually decided to conduct our tests on their publicly available Docker image. This Docker image contains an Apache Web server with a custom module, mod_esi.so. This module is a 20mb ELF 32-bit compiled version of their ESI implementation. Thankfully, reverse engineering it was not necessary since the aforementioned documentation is quite detailed. Since this is only a test image, our findings might not be representative of production Akamai instances. We were told that, in production, ESI is disabled by default and several mitigating controls are in place including an SSRF protection (a host whitelist among other mitigations) and an optional WAF. 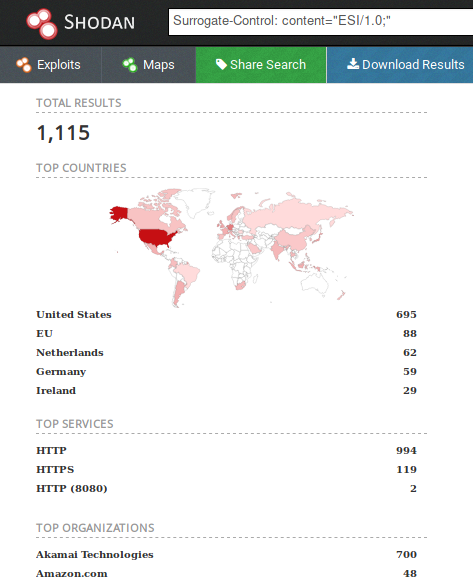 That being said, the Akamai ETS (ESI Test Server) appears to be vulnerable to all the scenarios mentioned above (SSRF, HTTPOnly bypass, XSS filter bypass). The Akamai ETS also offers a wide range of interesting features, such as the ESI debug mode. This mode is enabled with the <esi:debug/> operand which, when activated, will add to the HTTP response a large amount of debugging information, such as the raw file (as seen by the Surrogate, not the application server) and all environment variables. It is also possible to add eXtensible Stylesheet Language Transformations (XSLT) based ESI includes by specifying the xslt value to the dca parameter. The following include will cause the HTTP surrogate to request the XML and XSLT file. The XSLT file is then used to filter the XML file. This XML file can be used to perform XML External Entity (XXE) attacks. This allows attackers to perform SSRF attacks, which is not very useful since this must be performed through ESI includes, which is an SSRF vector itself. External DTDs are not parsed since the underlying library (Xalan) has no support for it. This means we cannot extract local files. Some NodeJS modules were developed to support ESI tags. They can be used as middleware, mimicking a surrogate, or inline in the source code. This library's implementation of the ESI spec is rather large, supporting includes, variables, and cookies. This module is only capable of ESI includes and does not allow ESI variables. When contacted about ESI Injection, the module's maintainer implemented a host whitelist mechanism and added a security section to the module's documentation. We have not conducted tests on any other vendors than the aforementioned; this is not an endorsement or a criticism of any other products regarding the security of their ESI implementation. Some surrogates will require ESI handling to be signaled in the Surrogate-Control HTTP header, allowing an easy detection. This header is used to indicate to upstream servers that ESI tags could be present in the response, and they should be parsed as such. If you observe an HTTP header response like the following:Surrogate-Control: content="ESI/1.0”, you are probably dealing with an ESI-enabled infrastructure. However, most proxies and load balancers will remove this header from upstream before sending it down to the client. Some proxies also do not require any Surrogate-Control headers. Therefore, this is not a definitive way of identifying ESI use. Given the wide variety of feature selection in ESI implementations, no unique test can be performed to test for ESI injection. One would have to test various payloads and observe the side effects to properly identify ESI injectable endpoints. For example, ESI includes can be used to perform an SSRF to a server the attacker controls, but some implementations will require the host to be preemptively whitelisted. ESI is an old specification that has lost much of its original popularity. To our surprise, it is still used and being implemented in modern caching systems, although usually not with a full specification implementation, but rather a small, concise, subset of it. Most analyzed products will offer ESI as an optional feature, and as such, it is often disabled by default. Nonetheless, some products were found to be ESI-ready out of the box. Deployed WebSphere instances with the dynamic caching feature enabled should also be ESI-enabled. Due to deployment complexity, this target was not tested as part of our research. While modern squid releases do not enable ESI by default if you deploy it by compiling it from source, common Linux server distributions such as Debian and Ubuntu will offer ESI-enabled packages by default. As such, a deployed Squid instance obtained from these repositories will parse and execute ESI tags on the fly. This might not be what is expected from a seasoned system administrator. To check if your Squid installation is ESI-capable, execute $ squid -v and look for --enable-esi in the compile flags. It is unclear whether ESI is enabled by default or not for Oracle Fusion but it does require the presence of specific HTTP Headers for it to be activated. Thus, ESI injection is possible only when ESI is already in use between the caching and the application server. Due to deployment complexity, this target was not tested as part of our research. F5 Big-IP product seems to support ESI (requires login) but we have not been able to confirm what mitigations are in place and what are its capabilities from the limited information provided by the vendor. Due to deployment complexity, this target was not tested as part of our research. According to its documentation, LiteSpeed's ESI support is disabled by default. We have not explicitly tested the product. ESI injection is the result of neglecting to sanitize user-input. When an ESI-capable surrogate parses non-sanitized user inputs, then ESI injection is possible. 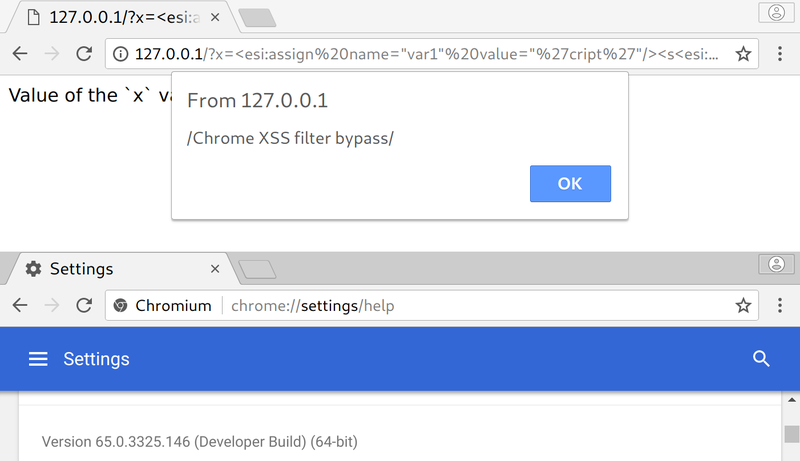 Whatever mitigation techniques against XSS recommended for the language or framework you are using will often be enough to protect against ESI injections. The ESI specification does not have any security considerations, and as such, the task is left to the developers to properly sanitize inputs. As previously discussed, it is possible to partially mitigate this vulnerability by whitelisting domains or hosts that can be reached by ESI includes. At the very least, the risks of enabling ESI should be specified by vendors to inform users of the unexpected side effects of ESI injection. A possible solution that brings at least a temporary remedy, is to place a first layer of defense in front of the ESI server. ModSecurity with the OWASP ModSecurity Core Rule Set (CRS) has you covered. All the example exploits presented in this paper are blocked by a default CRS installation. However, the detection depends on one or two rules alone. Therefore it seems beneficial to raise the CRS Paranoia Level to 2 or a higher setting. See https://coreruleset.org for more information about CRS and https://netnea.com for a set of tutorials. Today, we demonstrated a previously undocumented attack vector by abusing the ESI features present in both open source and proprietary caching services. We explained the conditions required for exploitation and three example payloads: Cookie exfiltration, SSRF and bypassing client-side XSS filtering. We then detailed the behavior of some implementations to give the application security community a sense of how the ESI world is fragmented. We hope that this research will serve as an inspiration to further document the state of other caching products and will give bug hunters an additional attack vector to consider. We would like to thank Laurent Desaulniers and Olivier Bilodeau for their contributions to this article and help in coordinating disclosure.